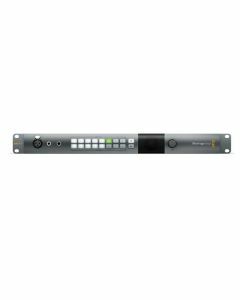 ATEM Talkback Converter 4K handles up to 8 cameras for SDI talkback using embedded audio channels 15 and 16 as used on the Blackmagic Studio Cameras and ATEM Camera Converter. Supports 12G-SDI for all SD, HD and Ultra HD formats up to 2160p60 and provides BNC connections to each camera, and an optical fiber socket for adding an optical fiber SFP module for extending camera distances when required. Includes push to talk buttons, support for tough and common aviation headsets, loop though for more than 8 camera support, built in speaker, front panel mic input and much more. SDI Program Input: 1 x 10-bit SD/HD/Ultra HD 4K auto switching program input from switcher, including tally information with 16 channel embedded audio. SDI Program Output: 1 x 10-bit SD/HD/Ultra HD 4K auto switching program loop thru output connects to another ATEM Talkback Converter 4K. SDI Camera Input: 8 x 10-bit SD/HD/Ultra HD 4K auto switching 16 channel embedded audio. SDI Camera Output: 8 x 10-bit SD/HD/Ultra HD 4K auto switching 16 channel embedded audio. SDI Output: 8 x 10-bit SD/HD/Ultra HD 4K auto switching 16 channel embedded audio. Optical Fiber Video Input (Optional): 8 x single mode SD/HD/Ultra HD 4K auto switching camera inputs with LC connector. Optical Fiber Video Output (Optional): 8 x single mode SD/HD/Ultra HD 4K auto switching camera outputs with LC connector. Optical Fiber Audio Input: 8 x single mode camera audio inputs with LC connector. Channels 1 and 2 are camera audio. Channels 15 and 16 are intercom audio. Optical Fiber Audio Output: 8 x single mode camera audio outputs with LC connector. Channels 1 and 2 are camera audio. Channels 15 and 16 are intercom audio. Computer Interface: 1 x mini-B type USB connector for firmware updates. 4K Format Support: 3840 x 2160p23.98, 3840 x 2160p24, 3840 x 2160p25, 3840 x 2160p29.97, 3840 x 2160p30, 3840 x 2160p50, 3840 x 2160p60, 4096 x 2160p23.98, 4096 x 2160p24, 4096 x 2160p25, 4096 x 2160p29.97, 4096 x 2160p30, 4096 x 2160p50, 4096 x 2160p60. SDI Compliance: SMPTE 259M, SMPTE 292M, SMPTE 296M, SMPTE 372M, SMPTE 424M Level B, SMPTE 425M. Audio Sampling: Television standard sample rate of 48Khz, 24-bit A/D conversion. Multiple Rate Support: SDI switches between SD, HD and Ultra HD 4K. Power Supply: 110 - 240V AC input with redundant 12-31V DC input. Repair policy: Excluding connectors, cables, cooling fans, fiber optic modules, fuses and keyboards which will be free from defects in materials and workmanship for a period of 12 months from the date of purchase.